Last week, the folks at Performance Designed Products sent us one of their new NFL Faceoff Controllers to use and review. 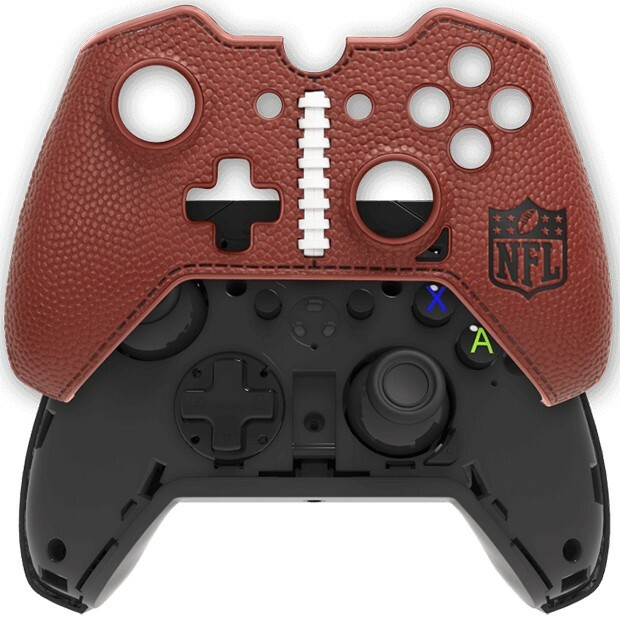 These controllers, designed for the Xbox One and Windows, feature detachable faceplates with official licensed NFL team logos and graphics. The box I received the Faceoff Controller in was solidly constructed, with a window that allows you to view the controller, should you be interested in purchasing it. The faceplate that comes with the controller is cool enough, and features a football texture with raised laces. It’s not rubberized, which is a missed opportunity in my book; but I’m sure those who want more grip are probably already covering their controllers in something else. Still, the provided NFL faceplate is really nice, at least from an aesthetic standpoint. PDP takes a unique approach to customization where you can order the faceplate of your choosing using the provided code — no need to scrounge the supply store for your favorite team or make a separate purchase. According to the website where you enter it, these faceplates retail for approximately $15, so consider that when evaluating the controller’s approximately $50 price tag. The process for ordering a faceplate featuring your team of choice was easy enough, even if I haven’t received that particular faceplate yet — it’s only been a little over a week. However, PDP supplied a Philadelphia Eagles controller in a separate shipment. It looks great and is very tasteful, as are all of the faceplates. Each features the team’s word mark splashed across the face, with a small logo on the right grip. Again, all of them showcase your favorite team without being too gaudy. Speaking of the faceplates, they are made of a stiff plastic, and snap on and off with ease. You can see all of the faceplates here. Regarding the controller itself — admittedly this is more important than looks — it is a nice feeling controller with adequate response and one potential flaw. First, the controller has some heft, and feels as good as my official Xbox One controllers that came with the system. The triggers are a bit louder when springing back into place, while the D-pad is a bit softer in volume and feel. Neither difference affected my play. The sticks felt as good as any other controller, though, I didn’t play any super-sensitive games requiring pixel-level control. They were perfectly functional for the various sports games I played. In terms of features, the controller accepts a chat microphone and includes on-board volume control. By holding down a flat audio button near the right thumb stick, the D-pad turns into a volume controller. Up and down adjusts game volume; left and right affects game/chat balance; double clicking the audio button mutes the mic. The Faceoff also features dual-rumble motors, which felt nice. Finally, the one flaw for some: This is a wired controller. It ships with a 10-foot wire, which was fine for my PC but too short for my entertainment center setup. This may be a big issue for some; others may like the advantage of pure USB plug and play. 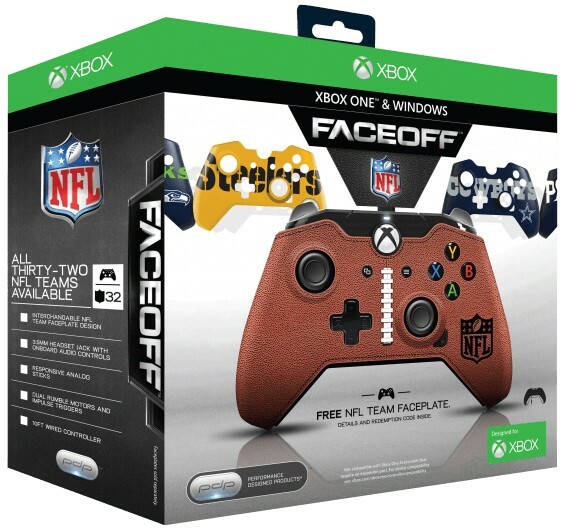 The Faceoff NFL controller is a nice controller if you are in the market for a wired controller and would like to show off your favorite NFL team. I like the included football faceplate as much as the Eagles one. It plays well enough and the audio features are a nice addition. The only potential issue is its attached wire, which may be a problem or a feature, depending on your perspective.